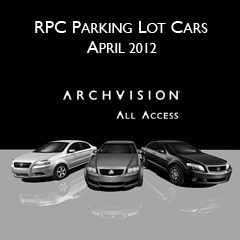 ArchVision proudly announces April parking lot car additions to the All Access Exchange. This all new collection features the classic Holden Commodore sedan, spacious wide-bodied Holden Caprice sedan, and the attractive compact Holden Barina (the Chevy Aveo’s Australian cousin). These parking lot cars are perfect for any still or animation.